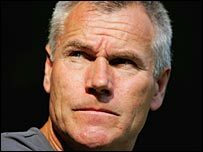 Stevenage Borough manager Peter Taylor will leave the club this week after failing to guide them to a Blue Square Premier play-off place. The former England caretaker boss took over in November after Mark Stimson resigned to become Gillingham manager. Boro chairman Phil Wallace told the club website: "It's been difficult for all of us, but now we need to regroup, rethink and go again next season. "We expect to make an announcement very quickly - hopefully within 10 days."